Mary is an experienced poet who helped the students to think about things they could write about in a unique way. The project offered a developmental framework for groups of young people in Derry and Donegal to develop authentic and meaningful stories and youth narratives through poetry, prose and spoken word. Throughout the workshops, young people were encouraged to develop their individual responses to their own world. Sinead’s published work, entitled, ‘Party Bruises,’ tells the story of a typical teenage night out in a humorous and witty fashion. The poem was well received by other students and facilitators and made the final cut for the publication, which was produced by Sligo company Kids Own, which is the country’s only dedicated publisher of books for children by children. This was done in collaboration with the Donegal County Council Library Service and Libraries NI. The publication, which featured Sinead’s work was produced on a cross border basis and was funded by the Department of Foreign Affairs through the cross border peace and reconciliation fund. The work of writers from Letterkenny and Strathfoyle was published in a Young Writers’ Broadsheet. 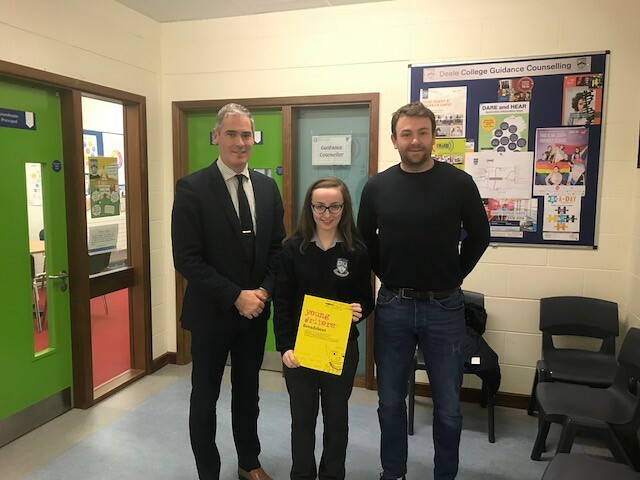 School Principal, Mr Joe Boyle was delighted that Sinead’s work has been recognised in such a prestigious way and says that she should be very proud of her achievements. “To have your work published is absolutely brilliant and I applaud Sinead for her initiative and creativity. Having read the poem, I can see why it impressed so many people and I think that it is great that our students are creating their own material and not just learning off other people’s work in the classroom.